Country Club Creek Trail is located in Southeast Austin beginning at Roy G Guerrero Park. 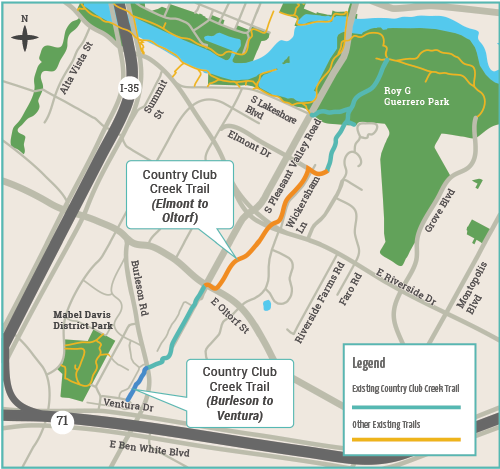 The Urban Trails Program is working to expand Country Club Creek Trail to connect Lady Bird Lake to Mabel Davis Park. This project will connect to existing trails to the south and the north, from Elmont Drive to Oltorf Street along Country Club Creek. It will also provide a connection from Roy G Guerrero Park to Mabel Davis Park. The project team hosted the second public meeting on February 5, 2015. The purpose of this meeting was to share recommendations for Country Club Creek Trail and get feedback. SIgn up to receive updates about Country Club Creek Trail.